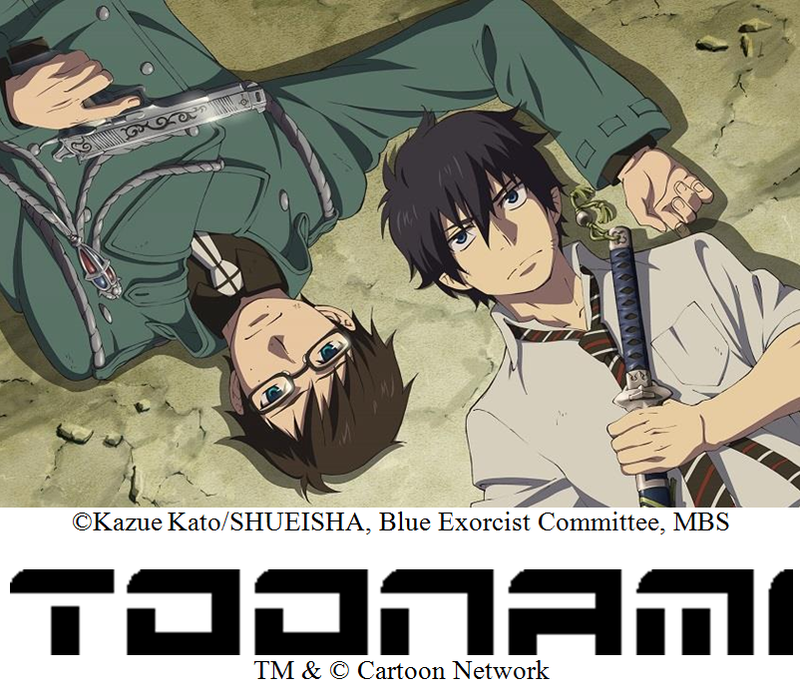 SANTA MONICA, CA (November 22, 2013) –Aniplex of America has announced on their Aniplex Live Show on Friday that their popular title, Blue Exorcist TV Series, will be making its U.S. network television debut on Adult Swim’s TOONAMI™ in March 2014. Details of the air date and time will be announced on a later date. Assiah: the realm of humans. Gehenna: the realm of demons. Normally, these two dimensions would never intersect, but having possessed all material substances, the demons are now intruding on the material world. But among the human race, there are those who can exorcise such demons – the Exorcists. 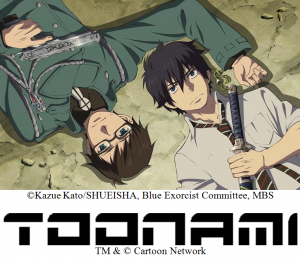 Based on the manga by Kazue Kato (published on Jump Square by Shueisha), Blue Exorcist successfully depicts a hero, Rin Okumura, an energetic, yet naïve young man who aims to become the ultimate exorcist. The manga has been made into animation in the hands of Japan’s acclaimed staff including director Tensai Okamura (Wolf ’s Rain, Darker Than Black) and Animation Studio A-1 Pictures (Sword Art Online, Magi: The Labyrinth of Magic, Oreimo 2). Aniplex of America Inc. (Santa Monica, California) is a subsidiary of Aniplex Inc. (headquartered in Tokyo, Japan), a group of Sony Music Entertainment (Japan) Inc. and a leading provider of anime content and music production and distribution in Japan. Aniplex of America has launched fan-favorite Blu-Ray and DVD releases such as Bakemonogatari, Durarara! !, Fate/Zero, Puella Magi Madoka Magica, the Garden of Sinners, Sword Art Online, Blue Exorcist, and Blast of Tempest. The company’s ever-growing line-up of shows includes our most recent titles Kill la Kill, Monogatari Series Second Season, Day Break Illusion, SERVANT x SERVICE, Silver Spoon, Magi: The Kingdom of Magic, Oreshura, Oreimo 2, VALVRAVE the Liberator, Vividred Operation, and Samurai Flamenco.